Powered stair climbers designed to move heavy, bulky and awkward loads up or down stairs with little effort. The powered stair climbers overcome the limitations of man power when lifting and transporting heavy equipment, minimizing or eliminating personal risks. When handling large, bulky items on stairs, practicality and safety are paramount. 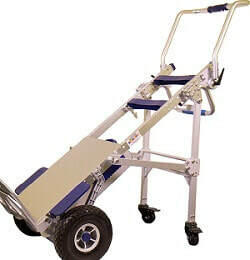 The powered stair climbers comply with HSE guidelines and are designed to deal with these issues perfectly. Our powered stair climbers can transport heavy weights in restricted spaces such as narrow staircases, with less man power, eliminating the risk of potential accidents and reducing labour costs and time significantly thus increasing efficiency. Although sometimes a manual trolley is used for carrying materials on stairs, this method is not as safe or efficient as the powered stair climbers because of the many risks involved. IT equipment, paper, printed material, PCs, printers, office copiers, full filing cabinets, archive storage boxes. Shops and retail - TVs, chiller cabinets, white goods and domestic appliances, such as washing machines, commercial catering equipment. Boilers, heating, ventilation and air conditioning units, hot water cylinders, pumps, radiators. Juke boxes, fruit machines, vending machines. Medical & dental equipment, gas cylinders, bottled gases, 45 gallon drums, ﬁre cabinets, security safes, motors, rail industry, courier delivery services. Competitive purchase and leasing options. National maintenance through our team of engineers. Extensive range of power stair climber accessories for bespoke requirements. One-man operation to reduce manpower. Conform to EC handling regulations. The Sprinter 150 powered stair climbers can carry loads of up to 150 Kg. These powered stair climbers can transport heavy loads up and down stairs with minimum effort with a single operator, saving money and labour costs. 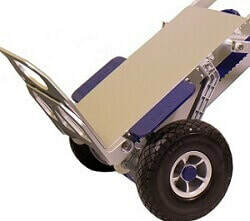 This climber trolley is in line with health and safety guidelines and will provide a quick return on your investment. Adjustable handle for varying load heights. Highly portable. Twin speed: Fast 34 steps per min/ Slow 17 steps per min. Lithium battery technology – Charging battery time 2.5 – 4.5 hours. Battery meter. Weight of battery 2.3 kg. Removable for easy charging. Push button control. Extendable handrail. These powered stair climbers are powerful machines from our Sprinter range. Highly portable and economic, these powered stair climbers can carry weights of up to 190 Kg, featuring puncture proof tyres, touch button control, rechargeable battery and a powered LED monitor. These powered stair climbers are efficient, easy to operate and comply with health and safety guidelines for your peace of mind. Adjustable handle for varying load heights up to 190 Kg. Battery meter. Weight of battery 3 Kg that can be easily removed for charging. Aluminium frame and quick connect safety straps. Extendable and foldable handrail with brake function. Easily operated by a single person.